A country cannot be a colony for over three hundred years and not imbibe the culture of the colonizer. Such is the case with the Philippines which was a Spanish colony from 1521 to 1898 when the colonial rule ended with a Filipino revolution cut short when Spain ceded the country to the Americans with the signing of the Treaty of Paris for twenty million dollars. Spain not only brought the Catholic religion to the Philippine islands it also brought with it its culture and its cuisine. And the impact of the Spanish influence on local cuisine is very much evident during religious feasts, especially at Christmas. It has often been noted that no country has more holidays than the Philippines and neither is there a country with a longer Christmas season. Both are offshoots of the inculcation of Catholicism on the population. Days dedicated to patron saints are accompanied by fiestas when the locals cook enough food to feed an army, as the metaphor goes. Family, friends, friends of friends and total strangers are welcomed into the homes of Filipinos to partake of the spread of dishes that are cooked only on special occasions. Most of these special occasion dishes trace their roots to the Spanish colonial days. When the Spaniards arrived, they brought with them ingredients and labor-intensive cooking methods that were unknown in the Philippines. 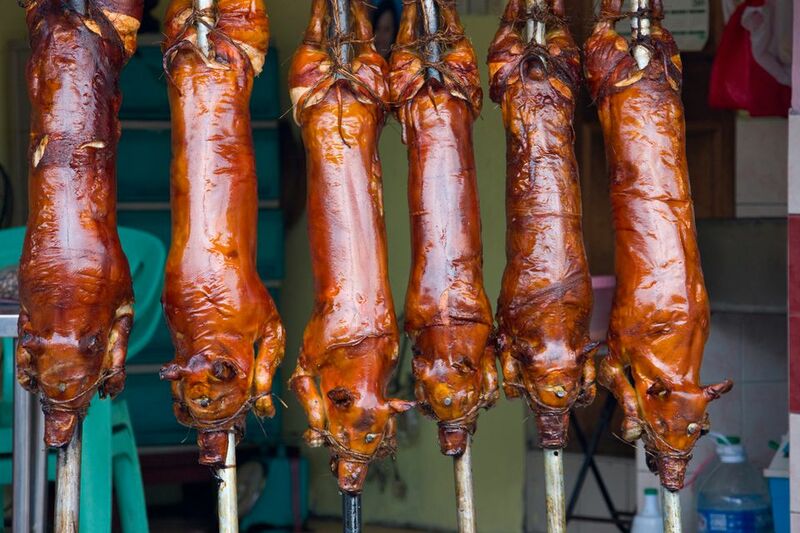 Roasted whole pigs, the rich meat stews and dairy-based sweets that the Spaniards loved were considered luxuries to the locals. Consequently, in the Filipino home, these dishes were reserved only for specials days like fiestas and Christmas. Put another way, the Filipinos turned so deeply Catholic that, to their minds, no occasion is more special than the days dedicated to the important personages in the history of the Catholic church. Over time, Filipinos came up with their adaptations of these various Spanish dishes. But the idea that they were more appropriate for feasts than for everyday meals remained. And because the most important personality in the Catholic religion is Jesus, then, his natal day is the most special of all occasions. It is hardly surprising that the Noche Buena feast and the Christmas day meals are laden with for-special-occasions-only Spanish dishes and local adaptations of Spanish dishes. Lechon, puchero, fabada, paella, morcon, embutido, leche flan, and churros are only some of the favorite Christmas dishes. But, you may think, the Philippines is a Third World country with more than ninety percent of the population living below the poverty line so how can the impoverished majority afford expensive ingredients like the morcilla in fabada or the ham hock and chorizo de Bilbao in puchero? While the rich can afford to cook and serve authentic Spanish dishes, the not-so-rich cook and serve adaptations of the same dishes which, in many ways, means substituting cheaper local counterparts for the expensive imported ingredients. Lechon in a humble household may mean a pig's head rather than a whole pig and the paella will probably be tinted with the local kasubha in lieu of the prohibitively-priced saffron. The dishes may be budget-friendly versions of the originals but they are still referred to by their traditional names. And because they are traditionally associated with Christmas, they will be present, in one form or another, on the dinner table of the humblest home in the Philippines.